NIOS Tutor Mark Assignment 2017-18 All students who will appear in class 10th & 12th Examination held in March April can find Tutor marks Assignment (TMA) Online. NIOS is conducting Public Examinations twice in a year i.e. October and April, respectively in the entire length and breadth of the country. Solved assignment, GET TMA (Tutor Mark Assignment) 2017-2018. 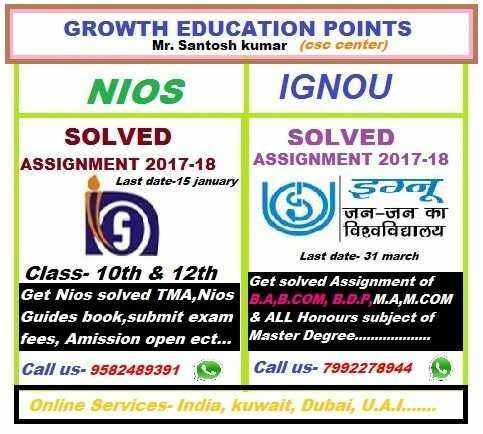 We are providing solved Assignments of (NIOS, IGNOU) current session for 10TH, 12TH Both Hindi and English medium. Secondary: Hindi (201), English (202), Sanskrit (209), Mathematics (211), Science & Technology (212), Social Science (213), Economics 214), Business studies (215), Home Science (216), Data Entry Operations (229), Psychology (222), Indian Culture & Heritage (223) & Painting (225). Sr. Secondary : Hindi (301), English (302), Sanskrit (309), Mathematics (311), Physics (312), Chemistry (313), Biology (314), History (315), Geography (316), Political Sc. (317), Economics (318), Business Studies (319), Accountancy (320), Home Science (321), Psychology (328) ,Sociology (331), Painting (332),Environmental Science (333), Data entry Operations (336) and Introduction to Law (338). The above information has already been incorporated in the prospectus 2017-18. This will be effective w.e.f. 01st May, 2017.